Gray Nicolls ® Kwik Cricket Coaching Sets - new and a better specification range of equipment. Bowed bats for better shape and weighted and gripped like a real cricket bat. The idea is to replicate real cricket more closely. Kwik Cricket sets are an alternative to traditional cricket to allow play at anytime of the year, either indoor or outdoor. 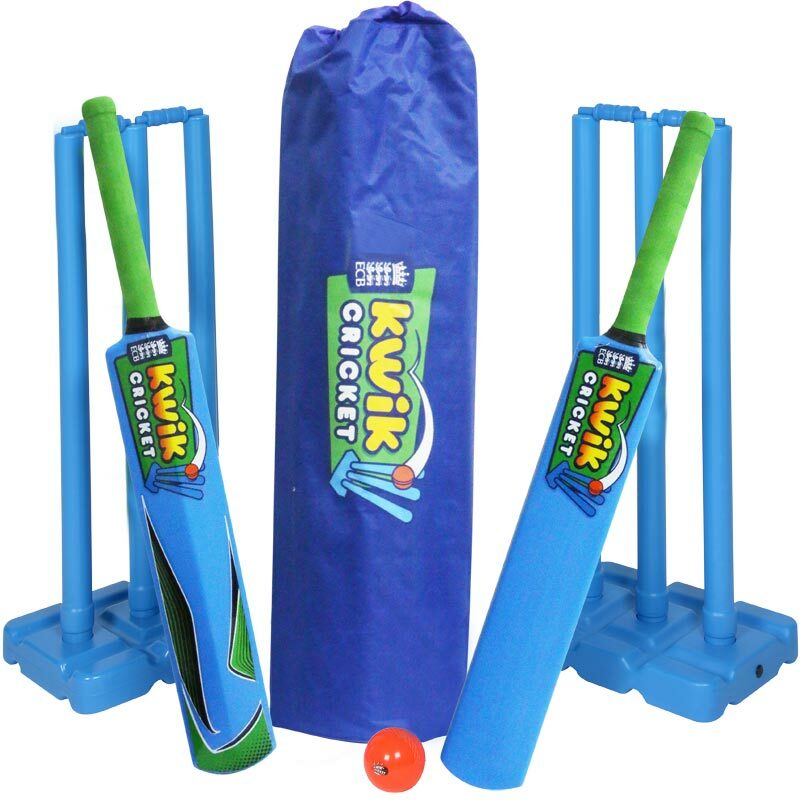 The Kwik Cricket sets are manufactured from high quality moulded plastic and are light but extremely tough and durable. Kwik Cricket is an approved product of the ECB and is available in different sizes. It has been designed as an alternative to traditional equipment to allow the game to be played safely on any flat surface either indoors or outdoors at any time of the year. Each set includes the following items - 2 bats (available in three sizes), 2 balls, 2 stump bases, 6 stumps, 1 holdall. Kinder Set - Contains Kinder bats - 55.88cm (22in) equivalent to size 0, approx age 3-5 years. Small Set - Contains Small bats - 71.12cm (28in) equivalent to size 3, approx age 6-8 years. Medium Set - Contains Medium bats - 76.20cm (30in) equivalent to size 5, approx age 9-11 years. Mixed Set - Contains 1 Medium and 1 Small bat. Love this set, perfect for families wanting to get a bit active with their kids, can't fault it, bought two sized bats and one additional size so all my children can play ?? Excellent starter set. I purchased three different size bats for my children (and me) and the children find the size/ weight really good. Balls are a good weight for both fun adult and child games . In the initial delivery I had one misshapen ball and a damaged ball tee, but Newitts responded quickly and sent out replacements immediately. So much better than the wooden sets you get for children. My 6 year old can't stop playing cricket. Just the right weight and height and the wickets have their own stand so you don't have to make holes in the garden! Ideal for primary school introduction to cricket. Solid design and contains everything required. Bails are a bit too light for windy weather. This is a superb product at a great price. Extremely robust and can be used on all sorts of uneven surfaces. We are looking forward to using it all over the winter at our local park. This has been a great buy - my kids (aged 8, 6 and 3) have played all summer. Really convenient to have the bag to lug it around in too. Purchased for our grandson's 8th birthday and we had hours of play time with it on the beach on holiday with Grandad and Dad giving him instruction . (Both these adults impressed with the quality of the set). Even his 3 year old brother joined in (with the smaller bat) and became a wonderful fielder with much improving throwing and catching skills during the week. The extras of gloves and pads that I bought with it proved to be a winner for a lad who likes dressing the part. Excellent service and product. Thank y ou. My two grandsons aged 6 and 7 love it. And I bought the set with two different size bats which solved all arguments! I bought this set for my son whose just turned 5. I wasn't sure what size bat to get him so got the small which ended up being too big so I ordered a Kinder size bat in addition. He loves playing cricket with this set. Two of the plastic stumps were a little bowed making it difficult to rest the bails on top. However, Newitts spoke to the supplier who quickly replaced them free of charge. This set is very light and highly portable in the kit bag. Would highly recommend. Bought for my grandson's 5th birthday, with 2 different sized bats. He is thrilled with the set and all the family have enjoyed playing. Very happy with purchase. cricket set a winner and have to say Newitts were brilliant. The set was well received by my grandson and already well used. Great kwik cricket set for my 7 year old, ordered along with the cricket tee, exactly the same set used at training sessions. Super fast delivery up to Edinburgh (no one at all stocks the set up here) and all very efficient. Received a Newitts catalogue with the order and the range of cricket stock appears immense, definitely the website to go for future purchases! This is a good rpoduct, well liked, well used. Shame about the Asda branding all over it, but apart from that, top notch. 5 out of 5 ANYONE FOR CRICKET?!! I bought this set for my grandson for his 9th birthday. He was so excited that all 10 adults and children were out at the quiet end of their cul-de-sac playing cricket. Even a couple of the neighbour's children came out to join in. Super present for getting the children out in the fresh air and away from computer games and TV. The children are really enjoying playing with the set and the adults can join in . A great game for the summer which you can take on holiday or to the beach .